One Hot Stove: Less is More: The Round-up! Less is More: The Round-up! A couple of years ago, Coffee started the Monthly Blog Patrol as a way for food bloggers to cook and learn from each other's recipes. This month, 64 bloggers from all over the world took up a challenge: choose a recipe that has five ingredients or less and show us how less is more! 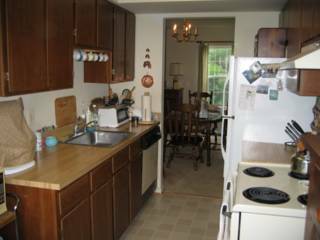 Based on the entries that I have received, I have organized the round-up in a few different categories: you can grab a hot or cold beverage to begin with, and proceed to look at a delicious list of breads, condiments, small meals and entrees, vegetables and desserts, all made using only a handful of ingredients. White chocolate. Cardamom. Milk. Cardamom-scented White Hot Chocolate. Chocolate. Milk. Arrowroot. Sugar. Orange zest. The Nun's Revenge. Mango. Yogurt. Sugar. Cardamom. Mango Lassi. Mango. Yogurt. Milk. Sugar. Mango Drink. Pomegranate. Ginger. Honey. Pomegranate Juice. Cucumber. Yogurt. Ginger. Mint. Chaat masala. Cucumber Cooler. Flour. Yeast. Basic Basic Basic Bread. Flour. Yeast. Tomatoes. Onions. Herbs. Ladenia. Flour. Potato. Yeast. Margarine. Laadi Pav. Flour. Yeast. Onions. Sugar. Pepper. Caramelized Onion Bread. Atta. Potatoes. Cumin seeds. Green chili peppers. Cilantro. Aloo Paratha. Whole wheat flour. Potatoes. Cilantro. Cumin. Green chillies. Aloo Paratha. Pizza crust mix. Tomato sauce. Oregano. Baby Spinach. Cheese. Twirly Whirly Pizza. Strawberries. Sugar. Lemon. Cloves. Strawberry Jam. Blackberries. Sugar. Lemon. Blackberry Sauce. Tomatoes. Raisins. Jaggery. Lemon juice. Tempering. Tomato Oambal. Green tomatoes. Onion. Green chillies. Cumin. Tempering. Green Tomato Chutney. Sun-dried tomatoes. Fresh tomato. Chillies. Tomato Thokku. Onions. Red chillies. Tamarind. Onion Chutney. Chillies. Mustard seed powder. Lemon juice. Turmeric. Raita Marcha. Toor dal. Tamarind. Red chillies. Cumin. Turmeric. Kandi Pachadi. Sesame seeds. Toor dal. Cumin. Coriander seeds. Red chillies. Nuvvullu Podi. Peanuts. Onion. Red chillies. Tamarind. Tempering. Peanut Chutney. Rice flour. Moong dal. Ajwain. Red chilli powder. Rice Flour Rings. Rice flour. Buttermilk. Red chillies. Tempering. Mor Kali. Urad dal. Chillies. Ginger. Curry leaves. Medhu Vadai. Leftover rice. Besan. Chillies. Mustard seeds. Rice Bites. Paneer. Herbs. Yogurt. Green chilli. Onion. Hara Paneer Tikka. Sago pearls. Peanuts. Sugar. Potato. Tempering. Sago Khichdi. Poha. Jaggery. Tamarind. Tempering. 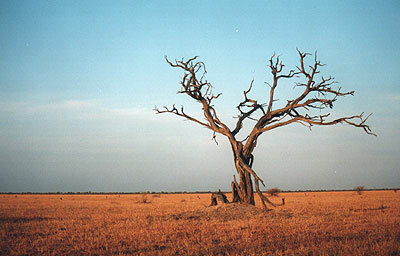 Gojavalakki. Thin pohe. Coconut. Jaggery. Pohe Masala. Kalavalele Pohe. Rawa. Cucumber. Flax seeds. Cucumber Pancakes. Millet flour. Rice flour. Ragi Dosa. Rice. Ripe bananas. Methi seeds. Banana Bread Dosa. Tamarind. Onions. Green chillies. Sugar. Pachipulusu. Toor dal. Tempering. Tamarind. Jaggery. Goda masala. Amti. Rajma. Onions. Tomatoes. Chilli powder. Dhaba Da Rajma. Basmati rice. Cumin. Bay leaf. Cinnamon. Cardamom. Jeera Rice. Cooked rice. Onions. Lemon juice. Tempering. Garnishing. Lemon Rice. Flour. Eggs. Milk. Oregano. Spaetzle. Tilapia. Chilli powder. Tamarind. Turmeric. Fish Fry. Arbi. Chickpea flour. Coriander-Cumin powder. Red chilli powder. Amchoor powder. Bhuni Arbi. Asparagus. Almonds. Lemon juice. Asparagus Amandine. Beet. Carrot. Lemon juice. Orange juice. Walnuts. Beet and Carrot Salad. Bitter gourd. Chilli powder. Baked Bitter Gourd Crisps. Broccoli. Onion. Garlic. Milk. Cream. Cream of Broccoli Soup. Carrots. Chillies. Peanuts. Lime juice. Tempering. Carrot Salad. Carrots. Peas. Tempering. Kasuri methi. Tomato. Gajar Matar. Capsicum. Moong dal. Cumin seeds. Onion. Garam masala. Bharwan Simla Mirch. Collard greens. Red chillies. Asafoetida. Soda bicarb. Kashmiri garam masala. Collard Greens Haak. Kohlrabi. Chana dal. Phodni. Tomato. Sugar. Simply Spiced Kohlrabi. Lotus roots. 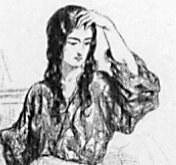 Khoora kharam. Lemon juice. Baked Lotus Root Chips. Mushrooms. Eggs. Cumin seeds. Turmeric powder. Red chilli powder. Spicy Egg Mushroom Rolls. ~ My Spicy Kitchen; inspired by What's For Lunch, Honey? Okra. Toor dal. Pepper. Simply "Delicious" Okra. Okra (vendakkai/lady's finger). Red chilli powder. Coriander powder. Turmeric. Tempering. Vendakkai Vadakkal. Plantain. Red chilli powder. Turmeric. Tempering. Vazhakkai Curry. Plantain. Coconut oil. Vegetable oil. Red chilli powder. Baked Plantain Chips. Potato. Cilantro. Chipotle. Coriander Rosti. Potato. Chilli powder. Garlic. Potato & Garlic Roast. ~ Cham of Spice-club; inspired by En Vittu Virundhu. Potato. Bread slices. Red chilli powder. Cumin powder. Coriander leaves. Aloo Tikki. Radish. Chillies. Tempering. Lemon juice. Mujj Chatin. Spinach. Corn. Cumin seeds. Mustard seeds. Spinach with Corn. Spinach. Rice flour. Urad dal. Red chillies. Mashed Spinach. Summer squash. Garlic. Lemon juice. Vinegar. Grilled Marinated Summer Squash. Tendli. Garlic. Red chilli powder. Tamarind. 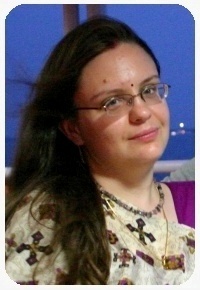 Tendlya Talasani. Vegetables. Soy sauce. Sesame seeds. Sesame oil. Pepper. Roasted Vegetables. Wheat flour. Jaggery. Ghee. Cardamom. Nuts. Thambittu. Broken wheat. Sugar. Cardamom. Lapsi Halwa. Wheat flour. Almonds. Sugar. Ghee. Rose water. Aate ka Sheera. ~ Jai and Bee of Jugalbandi; inspired by Pedatha.com. Yogurt. Sugar. Cardamom. Saffron. Almonds. Shrikhand. Milk. Condensed milk. Cardamom. Saffron. Oranges. Orange Basundi. Mango pulp. Cream. Gelatin. Sugar. Mango Cream JellO. Almond butter. Sugar. Khoya. Cardamom. Almond Butter Laddus. Besan. Ghee. Sugar. Cardamom. Raisins. Microwave Besan Ladoo. Ricotta cheese. Condensed milk. Cardamom. Saffron. Burfi. ~ The Cooker; inspired by Bong Mom's Cookbook. Coconut flakes. Egg whites. Flour. Sugar. Lemon zest. Coconut-Lemon Macaroons. Flour. Butter. Sugar. Cocoa powder. Chocolate chips. Granny Boyd's Biscuits. Digestive biscuits. Peanut butter. Sugar. Butter. Dark chocolate. Peanut Butter Chocolate Squares. Greek yogurt. Sugar. Vanilla. Frozen Yogurt. Plums. Sugar. Lemon juice. Arrowroot powder. Heavenly Plum Sorbet. Whipping cream. Lavender blossoms. Chocolate. Egg yolks. Sugar. Lavender Chocolate Pots de Creme. Chocolate. Avocado. Maple syrup. Orange juice. Decadent Chocolate Avocado Pate. There were some small giveaways associated with this event to thank all the participants who made it happen. I plugged the names of all the participants into a spreadsheet and used a random number generator to pull out names from a virtual hat. My sincere thanks to Anjali of Supreme Spice for offering these three giveaways. Winners, please get in touch with me so we can get your prizes to you soon! Many thanks to everyone for sending in these fantastic entries. P. S. The Monthly Blog Patrol theme for the next month is Fruit Fare; so please hunt around your favorite blogs for some inspiration and send the fruits of your labor to Aparna of My Diverse Kitchen, your next host! Great roundup. Bookamrked. Nice categories and loved more the pics for each. First look, thought it was ur creations. Later noticed the source below. The knitted stuff is so pretty. Best of luck for your work and study, Nupur! Jayasree, I did make these knits; the sources acknowledge where I got the patterns to make them. uvrao, Thank you for participating. Sra, Knitting food is fun :D Thanks for your wishes. oh those knits were brilliant! :) thanks for the round-up and enjoy your break! Oh my! Those knitted stuff are so adorable. Too bad you will be on blogging break, come back soon Nupur - we'll miss you. Nupur, lovely roundup and those knitted symbols just beautiful. Good Luck with work and study and will miss you and the posts a lot. The knits are fantastic...enjoy ur break..
Nupur, you are just FUNDU ! Will miss you..come back soon. Congratulations on a lovely roundup, Nupur. This is a treasure-trove that I, for one, will return to time and again. Great roundup Nupur.....The knits look just lovely- amazing work....keep it up. Awesome roundup Nupur! The Crochet and Knitting patterns look beautiful. I will learn from you soon. Best of luck for ur study and work! Enjoy the rest of summer! You have been busy going clickety-clack with those needles! I love your creations! Wonderful round up Nupur and many many thanks to you for making this happen. Have a great weekend and congratulations to the winners! Awesome roundup, beautiful knitted goodies and lots of hard work done by all the participants! Thank you for posting the round up and sharing the recipes. Good luck with your studies! Woohoo! I won I won! Haha..wonderful round up Nupur. Good luck while you work and study...will be visiting your blog during your absence anyways! take care and come back soon. Beautiful, Nupur! I love the yarn foods! Enjoy your studies this school year. Splendid job Nupur...the Knit based presentation is very innovative...must had worked hard for that....but i m sure all the applauds would had made all the work very satisfying! Have a happy break,hope to c u soon! oh wow, I didn't realize I missed the deadline! :) Really wanted to join this one... Anyway, I love this round up, all these easy recipes in one place, I am bookmarking this. BTW, love those knits... very cute! Enjoy your blogging break, Nupur... see you back here soon! Great round up and oh my! i just found this great food blog and you are going on a break!! Best of luck with your studies and work. What a gorgeous round-up Nupur! 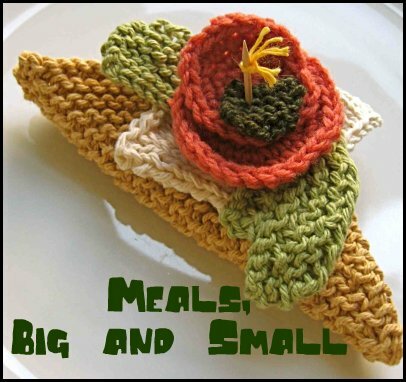 All your knitted and crocheted "food" are just amazing and so perfect for this! I can't wait to carefully look over all these posts - the whole concept of less is more is so appealing and I'm sure there are many, many wonderful ideas and recipes to be explored here. your little knits are sooo precious, nupur. Nice round up! Great topic. I am sorry I missed submitting something. How can I participate in the next one? What a lovely post Nupur. I love these little goodies. Tooo cute. You are such an inspiration for me in both knitting and cooking:). 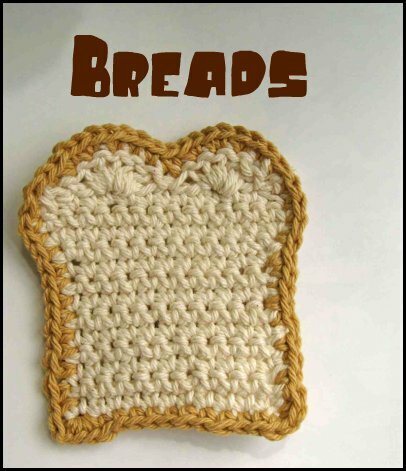 I must defnitely say your knits are so wonderful...the bread looks so realistic!! That was a quick and lovely round-up. Thanks for such a unique theme to MBP. It's my turn next hosting. Looks like you have been knitting a lot of food as well. They look lovely. Thats a prompt round-up, and so many more recipes to try out! great round up Nupur & wonderful Knits.. Thank you for hosting this event. Because of this event everybody has a list of nice recipes. This is a wonderful round up, and your knitting creations are awesome! Enjoy your well deserved break, get plenty of R &R. I am on vacation this week and will definitely try out dishes from your blog. I am amazed at how many recipes out there call for 5 or less ingredients. Thanks for a great roundup. have a lovely blogging break and enjoy whatever else it is that you do in the interim! Wow - the virtual recipes and the knitted ones! You are going on a long blogging break?! Like long long? But there is a party...You cannot not be there! This round up is really creative and knitted items look beautiful. Neat round up and very neat blog. Good luck with the serious work and study - and I cannot tell you how much I will miss your wonderful posts! I think I will go through a long and painful Onehotstove withdrawal process before I steady myself and move on with life. Grrreat round up! My favourite bookmark for sure. You are going on a break??? Thats not fair to us!!! :)...hope you are back soon...so long farewell! Wow. I'm going to cook from this round-up forever. All the best for ur work and study Nupur, will miss u for sure..! Great Round up Nupur, Love those small knitted goodies! Lovely round-up & some really fab entries, Nupur! 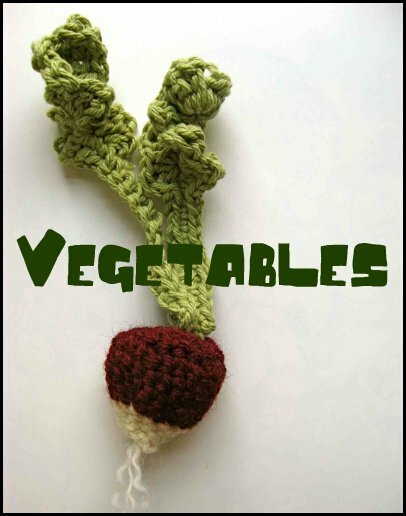 Loved your crochet work, especially the radish. Tooo cute! Will miss your posts but do hope to see you around! Very innovative way of roundup..nicely done and Congrats to all the winners..
Aha! 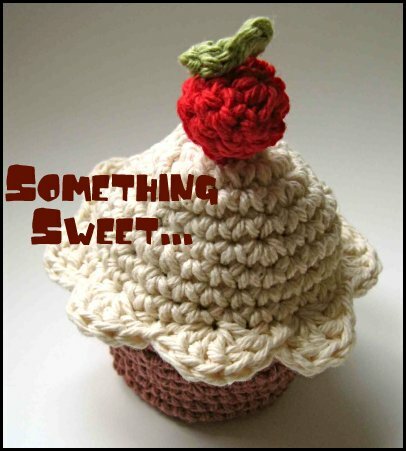 lovely round-up and the Crochet is so adorable ...so pretty ! 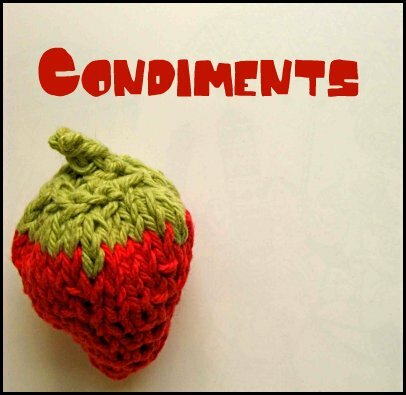 Your knitted food creations are adorable!! Great job on the round up. It looks like a lot of work. Enjoy your break and hope to see you around town if not on the net! Those wolly creations are just too cute. That was a fun theme you chose. Thanks for the roundup. Oh those knitted goodies they distracted me completely. Kudos to you Nupur! All the best for you new assignments. Really loved this round up and am book marking it!! what an amazing number of entries! And the knitted creations are tooo cute! Way to go! I will miss your posts Nupur - especially since I have gone back to work full time and down to posting only once a week, if that and am vicariously living through other bloggers whom I catch during my lunch break! Thank you for this excellently themed blog event, Nupur. You will be dearly missed. Awesome round up and what a way to introduce them!! Where did you learn knitting? I tried learning it 4-5 times but can't handle the two needles..... though I do a lot of crocheting. Hi Nupur, I have something waiting for you at my blog. What a lovely roundup, Nupur!! I had made a few more dishes from other blogs for this event but ran out of time since I went out of time. But it sure was a fantastic event. I am thrilled to receive the ginger extract from Anjali. It is fantastic! Thanks so much to you & Anjali both. Long time no post??? Looking forward to some dishes soon! The crochet patters are pretty and quaint! So is the round up. Will be back to check out the rest. I got through about 10! Hope things are going well with your work and study. Looking forward for your new post soon. Take care. Oooh! I have loads to catch up on OHS!!! Hope all is well at ur end! I have an award for u over at my blog, I do hope u will accept it. A warm WOOF to Dale! Missing your posts. Hope all is fine at your end and you can wind up your work n studies soon and come back to blogging soon. Hey Nupur ..hope things are fine at your end! Just stopping by to say hello. Been missing your posts, hope you are doing well. Hi Nupur - haven't seen a post from you for a while - I hope everything's ok. Hope to see you back soon! Wow!! WOW! I am in love with those crochet/knit stuff that you've done there. I showed that to my 2 yr old daughter and she's squealing here with delight. Thanks for the wonderful roundup and the even more wonderful crocheted pics! Hey Nupur, just dropped by to wish you a happy Diwali. Happy Diwali, dear Nupur to you & yours. How have you been doing? School must be keeping you busy. Miss your posts a lot. Your blog takes a long time to open ,pls do something about it. Hope everything is well with you and looking forward to seeing your posts. Its been such a long time now. I have been missing your posts:) Hope everything is fine at your end. Hi Nupur, you are taking a reallly long break. Hope there will be some aromas wafting from your kitchen and into the blogosphere this Thanksgiving. Hi Nupur, How've you been? Missing your posts! Come back sooon!! I could not recongnize the other pics. just take a look. Wow!!! Great round up Nupur. First time to your blog, and it is so wonderful. Great round up. Hope you have some free time for an occasional post or two in the new year. Hope you are doing good Nupur. Wish you a Happy and Prosperous New Year! HAPPY NEW YEAR, NUPUR! WISHING ALL UR LOVELY DREAMS N WISHES TO COME TRUE! Happy New Year, Dear Nupur, to you & yours!! Dear Nupur, wish you a fabulous 2009! Hope you are doing well! Hi nupur, I came across your blog ages back when I googled for some recipe - dont recall which one tho. And eversince, I would come by ever so often. Needless to say, you have an awesome blog and I must say, I do miss not having anything new to read here. Hello Nupur, how are you? No updates for long time? Hope all is well and you will be back soon. :) Happy New Year! Hi Nupur, that's a marvellous collection of craft pieces on this post. As always, a pleasure to visit your blog. Cheers! Hey Nupur! Just came over to say hi. Hope you are doing well and your studies are going well too. We do miss you. Take care and best wishes! Hey Nupur ! come back soon, our stoves are missing urs badly !! :) hope u r doing well.. I know, I haven't tried everything or even most of the things listed on the hot stove, but I still miss not seeing any new posts! Hope all is well, and the blogging will resume some time soon. Perhaps with the new year (Gudhi Padwa), you might choose to come back to the hot stove! Your recipes are cherished and you are missed. Enjoy your extended stay-away! Just wanted to say that I miss your posts so much!! I keep coming back here every week, hoping for a new one and to try out a recipe you have :-) I hope you are doing well and that maybe (fingers crossed) you will be back to blogging sometime. Cheers. First time in your blog... 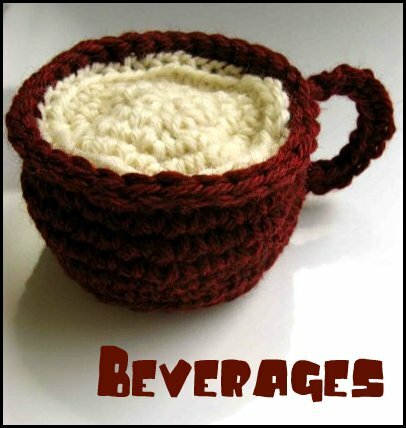 Wonderful crochets.. Amazing round up!! Potato Salad for Lunch, Honey!